Published by N7 Mobile Sp. z o. o. Free trial period NEVER expires. NEW FEATURE: OneDrive music support and folder music player! 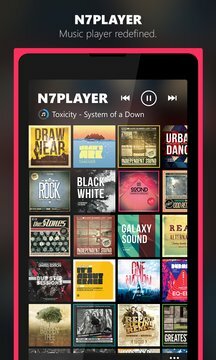 n7player is a supreme music player with innovative, one of a kind user interface. The n7player, widely known and critically acclaimed mp3 player with over 10 million downloads finally arrives on Windows platform! 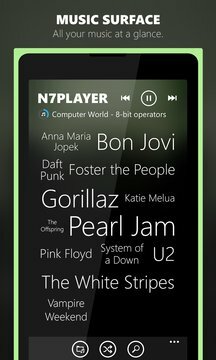 n7player Music Player is a feature-rich yet very clean and user friendly music player. It's unique artists surface allows quick and intuitive music browsing, making your whole library accessible at ease. Explore your library with gesture controlled interface. In n7player you are always one pinch away of your favorite album and, thanks to automatic album art downloader, your whole collection will always look good. Enqueue your favorite tracks, albums, artists - type a name and save as your playlist, it's simple as it sounds. If you need more control, you can always edit and reorder it.